Anyway, onto more important matters. This blog has been nominated for Best Navy Blog in the 2011 "Milbloggies"! Voting ends soon (like, today or tomorrow) so go to the website HERE and cast your vote! Thanks in advance for all your support and remember to vote early and vote often! Today I'm going to introduce you to the remaining two Air Force nurses whom you have yet to meet. These ladies are both integral parts of our team whose leadership and clinical skills augment our Navy group beautifully. They were here to welcome us when we arrived and, unfortunately, will be departing two to three months before we do. We can only hope their replacements bring as much to the table as they have! Captain Trogdon brings many years experience to the table in both nursing and leadership. She's a quiet one who, when not busy managing our pharmaceuticals or directing her team, can be found soaking up some rays in the alley or sweating it out to P90X DVDs. We rely on her in so many ways to keep us pointed in the right direction. So without further ado... Ms. Wendy Trogdon! 17 years. Enlisted for seven, as a medic. Then ten as an officer. Yes. Patriotic hearts on my shoulder! A Walk to Remember… It’s between that and Silence of the Lambs. SSSS: Wow! What a difference! That just shows my diversity in taste... "diversity in taste" sounds better than crazy! Star Wars. First time I saw it was at a drive in. I was like 12. Aren’t both of ‘em dead now? On me or them? Depends on the mood. Both will work! Probably go home for my niece's 21st (birthday) so I could drink a beer with her. It’s been a good experience but tough. Definitely worthwhile being here. We’re doing a lot of good. Helping a lot of good people and worked with a lot of good people. 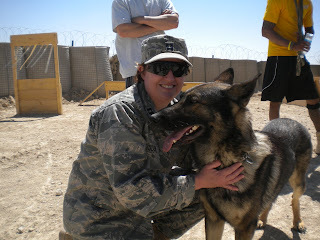 Major Jones is our most senior Air Force nurse here at the FST. She works hard to ensure that everyone is properly trained in all their duties as well as cross-trained to do other jobs. With as small a group as we are, her efforts to ensure that every position on every team has at least one, and usually multiple, backups is extremely important. Her quiet, calm manner makes her a very pleasant person to be around and her experience as a senior nurse brings so much to the team! Quite simply, Major Jones is a "Major" asset! She was my childhood hero. I liked the live action show with Linda Carter. I watched it diligently! Married. My husband was in the Army. He's retired now and works for FEMA. A three year old daughter. This is the second deployment she's had to go through. Growing up it was Sparkle. That was one about a girl who grew up in a bad neighborhood but then made it out! I don’t watch Twilight. I don't like scary movies. I get nightmares! For sweets there are these resealable packages of Chips Ahoy. Besides that I like the beef jerky. Tomorrow is never promised so enjoy today! Tell your loved ones that you love them!